Stylish Rohit Sharma authored a dream return to big-time cricket by cracking a world record individual score of 264 as India toyed with a hapless Sri Lanka to register an emphatic 153-run win in the fourth One-day International (ODI) match at the Eden Gardens here on Thursday. The 27-year-old Sharma, who had to pull out midway from the England tour in August following a finger injury, scripted one of the biggest comeback celebrations the game has ever seen to propel the hosts to a mammoth 404/5 before 30,000-odd mesmerised fans at the majestic Eden Gardens, celebrating its 150th anniversary. Having witnessed Rohit Sharma score a record breaking ODI double century for the second time, Indian skipper Virat Kohli said he was fortunate to have been part of a historic feat. Pakistan continued to dominate at their adopted home in the United Arab Emirates by defeating New Zealand by 248 runs in the opening Test of the three-match series in Abu Dhabi on Thursday. Novak Djokovic moved within touching distance of ending the year as the world No.1 after crushing Stan Wawrinka 6-3, 6-0 at the ATP Tour Finals. The bottom rung sides of the Indian Super League came face-to-face in order to better their fortunes by heaping more misery on the other. The match at the Jawaharlal Nehru Stadium on Thursday was an opportunity for the two teams to make an effort to climb up the ladder. The Sports Ministry today appointed a three-member panel comprising former India hockey captains Ajit Pal Singh, Ashok Kumar and Zafar Iqbal to assess the demands made by Terry Walsh to stay on as the chief coach of the national team. Playing in the new role of a challenger, five times world champion Viswanathan Anand is sitting pretty ahead of the fifth game of the World Chess Championship against Magnus Carlsen. The ongoing world chess title match between the reigning champion but out-of-form Magnus Carlsen and the Indian challenger in-form Viswanathan Anand is excitingly and intriguingly poised, say experts. London Olympic bronze medallist Saina Nehwal and top Indian male shuttlers Parupalli Kashyap and K Srikanth entered the quarterfinals of the China Open Super Series Premier after posting contrasting wins in their respective second round matches. World No. 5 Saina got the better of Qin Jinping of China 21-18 21-18 in a 43-minute contest in the women's singles match at the Haixia Olympic Sport Center. Neymar scored twice as Brazil continued their winning run under new head coach Dunga with a 4-0 victory against Turkey in a friendly in Istanbul. The 22-year-old also provided an assist to add to his brace and was aided by Willian. Neymar held off the attentions of the last defender to finish past Volkan Demirel after finding himself one on one with the Turkish goalkeeper in the 20th minute. Semih Kaya's own goal and Willian's strike gave the visitors a 3-0 halftime lead before Neymar completed the rout in the 60th minute. Stylish Rohit Sharma authored a dream return to big-time cricket by cracking a world record individual score of 264 as India toyed with a hapless Sri Lanka to register an emphatic 153-run win in the fourth One-day International (ODI) match at the Eden Gardens here on Thursday. The 27-year-old Sharma, who had to pull out midway from the England tour in August following a finger injury, scripted one of the biggest comeback celebrations the game has ever seen to propel the hosts to a mammoth 404/5 before 30,000-odd mesmerised fans at the majestic Eden Gardens, celebrating its 150th anniversary. Needing to score at a daunting 8.1 runs per over to upstage India, the visitors never came anywhere close to accepting the challenge and were bundled out for only 251 in 43.1 overs, as the home side took a 4-0 lead in the five-match series. In fact, the entire Sri Lankan team scored 13 less than Sharma, who is now the only batsman to score two ODI double hundreds — having plundered 209 against Australia last November in Bengaluru. He is also surpassed Virender Sehwag's 219, the existing highest ODI score. The Sri Lankan reply started off on a poor note, as they lost opener Kusal Perera (0) without any runs on the board in the very first over. The islanders suffered further jolts with Dinesh Chandimal (9), Mahela Jayawardene (2) and Tilakratne Dilshan (34) departing by the tenth over. At 48/4, the tourists needed a miracle to make the game competitive. Skipper Angelo Mathews (75) and Lahiru Thirmanne (59) put on 118 for the fifth wicket, but that was too little and too late, and only provided some respectability to the islanders' innings. Opening with Ajinkya Rahane, Sharma propelled the Indians to Eden's biggest total, as he scored the lion's share of the 155-ball, 202-run stand with skipper Virat Kohli (66; 64b, 6x4) for the third wicket. He added another 128 with Robin Uthappa (16) for the fifth wicket. Already 0-3 down in the series, the Lankans continued their poor show. While the bowlers were rendered chicken fodder for Sharma, the fielders also joined in the pathetic show giving three reprieves to the Mumbaikar. Bowling: Kulasekara	9-0-89-1; Mathews	8-1-44-2; Eranga	10-0-77-1; Perera 5-0-43-0; Prasanna	10-0-70-0; Mendis	7-0-70-0; Dilshan	1-0-11-1. Bowling: Yadav	8-0-38-2; Binny	8-0-55-2; Kulkarni	10-1-34-4; K Sharma	9-1-64-0; A Patel	7.1-0-51-2; Raina 1-0-3 0. 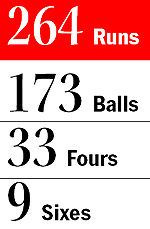 264 off 173 balls included 33 fours and 9 sixes, which amounts to 186 runs in boundaries. Incidentally, it's also a world record for most fours in a single innings. Very well batted Rohit. That's Rohit for everyone, sheer talent. Enjoy and witness the class in action. Rohit Sharma is now 2nd best performer against Sri Lankans after Lord Rama. A record which is going to stay !! A delight 2 watch! Well done bro for creating history! Next target @ImRo45 a double hundred in IPL, just asking...anything possible! Incredible, still can't believe. Batting conditions, ordinary bowling attack notwithstanding, it takes some doing getting 264 off 173 balls. Well done Rohit! Can't believe @ImRo45 didn't make a triple century... #useless. So @ImRo45 has now scored 2 double ODI tons.... I couldn't even get 1 ton.... #Useless. The last 50 ODI matches England have played, the team has averaged 259.... @ImRo45 scored 264 on his own! After cracking a world record 264, Rohit Sharma made it clear that he would not rest on his laurels, as he had “still lot more to do”. “I am happy, not relieved. I can tell you that at a young age, I never thought I will play that kind of innings and all the records happened to me. Still there is lot more to do,” he said. Starting the day needing two wickets to take a 1-0 lead in the series, Pakistan, who are forced to host matches in the UAE due to security concerns back home, dismissed the visitors for 231 in the second innings on the fifth morning. New Zealand leg-spinner Ish Sodhi (63) showed plenty of resilience to notch his second half century in Tests but was the last man to fall, out leg before to paceman Imran Khan. Fresh from inflicting a 2-0 defeat on Australia, Pakistan have continued their dominance against New Zealand, all three wins coming without their two main strike bowlers — banned off-spinner Saeed Ajmal and injured paceman Junaid Khan. New Zealand captain Brendon McCullum was well aware of what was in store for the visitors in the remaining tests, with the second match starting in Dubai on Monday. "Obviously we were clearly second in this Test match," McCullum said at the presentation ceremony. "Spin is a threat but so is reverse swing. The partnerships at the end of our innings gives us confidence for the rest of the series. "It would be nice if we could win the toss, bat first, and put some scoreboard pressure on Pakistan." The victory against New Zealand also made Misbah-ul-Haq the most successful Pakistan captain with 15 wins, ahead of Javed Miandad and Imran Khan on 14. Djokovic needs to win all three of his Group A matches to ensure he will hold off Roger Federer in the race for first place and the Serb secured the second of those victories with a ruthless 65-minute rout at London’s O2 Arena. The reigning Wimbledon champion will be guaranteed top spot if he beats Tomas Berdych on Friday in a match he also has to win to be certain of making the last four at the prestigious season-ending event. Wawrinka’s loss means the Swiss world No.4 needs to defeat US Open winner Marin Cilic, thrashed 6-3, 6-1 by Berdych earlier on Wednesday, to have a chance of making the last four. After demolishing Cilic for the loss of two games on Monday, Djokovic has lost only five games during his first two matches. Djokovic has won his last 29 indoor matches, including 12 in a row at the Tour Finals, and he remains on course to become the first player since Ivan Lendl in the 1980s to win the Tour Finals three years in a row. Berdych’s win over Cilic meant Djokovic was unable to guarantee his place in the last four whatever his result, unlike Wawrinka, who started knowing a victory would send him into the last four with a match to spare. But Djokovic had dominated his head to head match-up with Wawrinka, winning 15 of their 18 meetings. With a semifinal place up for grabs, Wawrinka came out swinging and he landed an early blow with a break in the first game. But Djokovic is far too cool a customer to be rattled by that opening salvo and he broke back in the fourth game. That was the signal for Djokovic to step up a gear and he took 21 points from a possible 24 during a run of five successive games that brought him a 5-2 lead. Wawrinka finally halted Djokovic’s streak in the next game, but it was too late to save the set. There was no let-up from the Serb in the second set and he continued to overwhelm Wawrinka from the baseline as he broke in the first game. That shattered Wawrinka’s resolve and the Swiss was blown away as took 12 of the final 13 games to leave his shell-shocked opponent shaking his head in disbelief as winner after winner flashed past him. Djokovic's stroll continued a trend that has seen all eight singles matches won in straight sets with little drama. Debutant Milos Raonic has withdrawn from the ATP Finals with a quad injury ahead of his final round-robin match against Japan's Kei Nishikori. The seventh-seeded Raonic, who lost his first two matches in Group B in straight sets, will be replaced by Spain's David Ferrer, the first alternate at the year-end tournament. Raonic said, “As badly as I wanted to play, you've got to be at the top of your game here and I couldn't be close to that today. Wouldn't have been fair to the fans if I had played a mediocre match or had to stop.” Six-time champion Roger Federer will take on Andy Murray in the group's other match. If the 17-time Grand Slam champion beats Murray and Nishikori defeats Ferrer, then the Scot will be eliminated from the indoor event. The bottom rung sides of the Indian Super League came face-to-face in order to better their fortunes by heaping more misery on the other. The match at the Jawaharlal Nehru Stadium on Thursday was an opportunity for the two teams to make an effort to climb up the ladder. Dynamos, with seven points from as many matches, and Goa, having five points to their tally, would have liked to win in order to back on track by picking three crucial points. The hosts had shown mettle in the defence but lacked creativity in the attack in their previous matches, but against the Zico’s side, their defence and attack fell apart like nine pins as they suffered an ignominious 1-4 defeat in front of the home crowd. Playing in Orange, it was Dynamos who had started the game on an attacking note when Morten Skoubo's first attempt on goal from the free kick went way over the crossbar. Dynamos attacked with more intent in the initial minutes, but couldn't find the breakthrough. Goa stepped up their game after observing their rivals for first few minutes as the visitors resorted to quick passing and created more set pieces. They opened their account in the 18th minute when defender Younes Bengelloun smashed the ball past Van Hout after the Dynamos keeper had done just enough to ward off Peter Costa's header off Debabrata's cross from the right. Delhi had almost found the equaliser in the 26th minute when Robert Lalthlamuana's perfect cross from the right was thwarted by Pires. Dynamos relied on moving swiftly in the midfield and sprayed crosses in the opponent’s area, but failed to level the scoreline till the half-time. After the lemon break, Goa came out of the tunnel as a different unit as they attacked the rival's citadel with delightful passes. In the 48th minute, Goa swelled their lead through Bengelloun when he scored from a free-kick after Pires was needlessly fouled by Hans Mulder. Pires then scored the third goal in the 53rd minute through a penalty conversion, although 'keeper Van Hout had got his left hand to the ball. 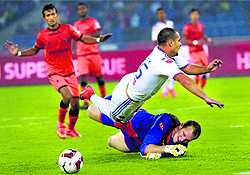 Goa piled on more misery on the hosts when Tolgay Ozbey's gem of a strike put the scoreline beyond the reach of Dynamos. Ozbey slammed home from inside the box after getting a neat pass from Pires. The panel has little time to decide on the future of Walsh, who has categorically said that he won't continue after his contract expires on November 19, if he doesn't have his way in running of the team. Sports secretary Ajit Sharan said the Ministry wants Walsh to carry on. "I have constituted a committee under the chairmanship of Ajit Pal Singh, also comprising Ashok Kumar and Zafar Iqbal. "This committee along with representatives from Hockey India and High Performance Director (Roelant Oltmans) will see to what extent Walsh's demands are reasonable, to what extent we can go along and so on. We would obviously like to retain him if possible," said Sharan, adding that the panel most likely will give their opinion to the ministry in a day or two. Walsh's sudden resignation last month came as a surprise to many after he guided India to their first Asian Games gold in 16 years. A day later, however, the Australian agreed to continue in his role provided his conditions were fulfilled. Last week, India stunned World Champions Australia in Perth under Walsh's guidance. Besides asking for more decision-making powers for himself and Oltmans, Walsh wants handpicked personnel as his support staff and more time with family in Australia. It has been reported that Walsh has asked for 120 days of paid leave, during which he will keep in touch with the team through video conferencing. "Walsh has said that there won't be a compromise on training of players, when he is away. Anyway, I am not an expert to say anything on the subject and that is why I have got these experts (three-member panel) to take a view on the matter. Their main job will be to study the demands put forth by Walsh and see what is in the best interest of the team," addded Sharan. With one victory, one loss and two draws, the match is currently tied 2-2, but a big trend seem to be favouring Anand compared to the last match at Chennai, which the Indian had lost badly last year. It was a tentative start for Anand in the first game, in which he got the complexities on the board but misplayed and suffered a bit before drawing the game. In the second game things turned for the worst for Anand, as yet again Carlsen established a position to his liking and outplayed him in all departments of the game to go one up in the match. As per the match schedule there is a rest day after every two games and that break changed things completely for Anand. “The next two games will be crucial for both the players. Anand plays white on Friday. If Anand approaches the game as he did during third game (good home preparation, complicated position) it will have a pressure on Carlsen,” World No.23 and Indian Grandmaster P. Harikrishna said. According to him, the Friday game will be crucial for Anand and with white pieces he should play for a win. 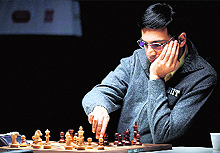 He said the match is not only a clash of generations (Anand aged 44 and Carlsen, 23) but also clash of styles. Anand plays tactical chess while Carlsen likes to simplify. London Olympic bronze medallist Saina Nehwal and top Indian male shuttlers Parupalli Kashyap and K Srikanth entered the quarterfinals of the China Open Super Series Premier after posting contrasting wins in their respective second round matches. World No. 5 Saina got the better of Qin Jinping of China 21-18 21-18 in a 43-minute contest in the women's singles match at the Haixia Olympic Sport Center. In men's singles second round, Commonwealth Games gold medallist Kashyap fought back from a game down to topple China's Xue Song 11-21 21-11 21-13 in 54 minutes, while Srikanth also faced a tough challenge from another Chinese, Gao Huan, before prevailing 21-17 19-21 21-14 in a marathon encounter that lasted an hour and 18 minutes. Sixth seeded Saina was made to work hard by the Chinese qualifier before the Indian used all her experience to wrap up the issue in her favour and advance to the next stage. Saina will now take on another Di Suo of China in the quarterfinals. Both the Indian men in the fray — Kashyap and Srikanth — were stretched to three games before they managed to hold on to their nerves to emerge victorious. Neymar scored twice as Brazil continued their winning run under new head coach Dunga with a 4-0 victory against Turkey in a friendly in Istanbul. The 22-year-old also provided an assist to add to his brace and was aided by Willian. Neymar held off the attentions of the last defender to finish past Volkan Demirel after finding himself one on one with the Turkish goalkeeper in the 20th minute. Semih Kaya's own goal and Willian's strike gave the visitors a 3-0 halftime lead before Neymar completed the rout in the 60th minute. Girls draw 2-2 with New Zealand, lose series 0-3: India's junior women's hockey team played out a 2-2 draw against hosts New Zealand but lost the six-match Test series 0-3 at at the TET Multisports Centre in Stratford, New Zealand. Both India and New Zealand made desperate efforts and gave each other a tough fight to score the opening goal until Felicity Reidy of the home team made the breakthrough to give her side a 1-0 lead. India's Lilima Minz immediately drew parity with a field goal. The Indian girls then snatched a 2-1 lead through Navjot Kaur. But two yellow cards and a green card proved costly for India as Deanna Ritchie managed to level the scores through a penalty corner. Hafeez reported for suspected illegal action: Pakistan all-rounder Mohammad Hafeez has been reported for a suspect illegal bowling action during the first Test against New Zealand, which the hosts won by 248 runs in Abu Dhabi on Thursday. The match officials' report, which was handed over to the Pakistan team manager Moin Khan, cited concerns about the legality of the 34-year-old's bowling action.Hafeez's bowling action will now be scrutinised further under the ICC process relating to suspect bowling actions reported in Tests, ODIs and T20Is. He is required to undergo testing within 21 days and during this period, Hafeez is permitted to continue bowling in international cricket until the results of the testing are known. Trials for sub junior girls football team on Nov 15: The Himachal Pradesh sub-junior girls football trials will be held at BBMB ground, Sundernagar on November 15. The trials will begin at 11 am. Players born after Jan 1, 2000 are eligible to take part. Players must bring attested certificates of date of birth by Municipal Council or Panchayat secretaries. Passports will be valid but school certificates will not be accepted.